Buy 6 Save $339.75 *Get up to 62% OFF when you purchase our 6 bottle promotion package! 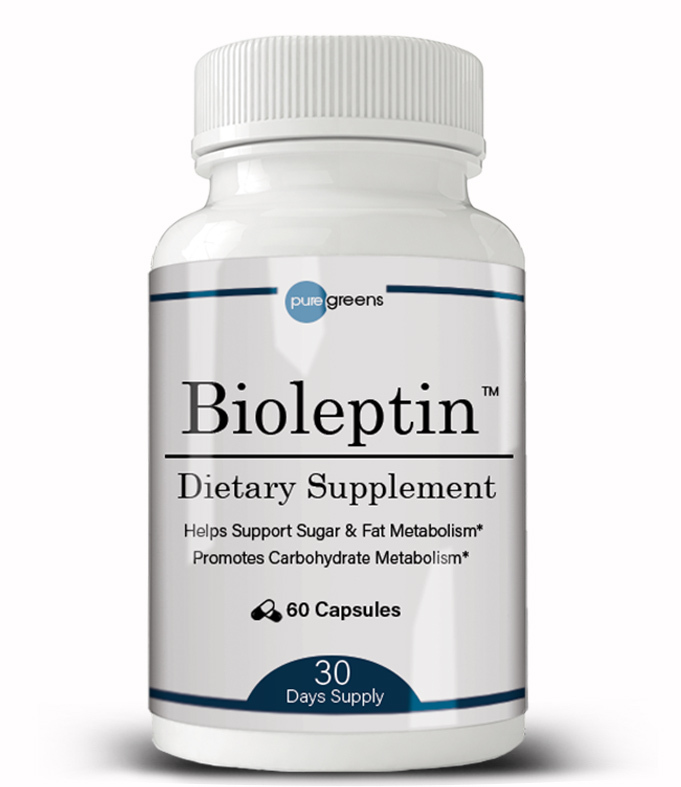 Bioleptin™ contains a scientifically-blended formula of Well Trim® and Chromium – essential compounds that promote healthy weight management. 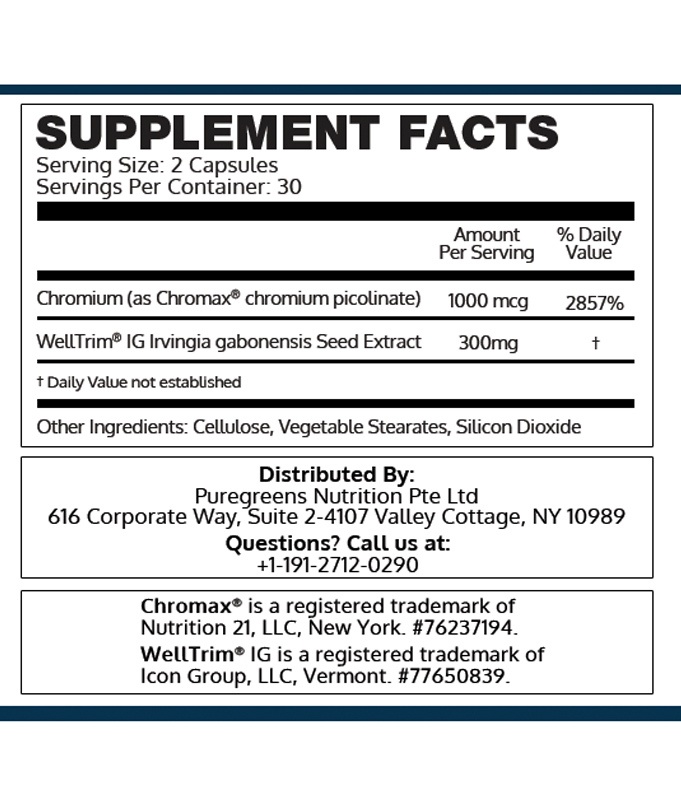 Chromium (as Chromax® chromium picolinate), Well Trim® IG African Mango (Seed) extract (Irvingia Gabonensis). As a dietary supplement, adults take two (2) capsules daily preferably one (1) capsule before each of the two largest meals or as recommended by physician. WARNING: Do not exceed recommended dose. Do not purchase of outer seal is broken or damaged. When using nutritional supplements, please consult with your physician if you are undergoing treatment for a medical condition. Keep out of the reach of children. Store at room temperature and do not expose to excessive heat or moisture. Not for use by individuals under 18 years, or if you are pregnant or nursing. At Puregreens Nutrition Pte Ltd, we are so sure of the effectiveness of our product that we are willing to put the entire risk on us. Our industry best 365-Day Money Back Guarantee states that either you are 100% satisfied, or your money back. You can place your order safely and know that absolutely nothing can go wrong. 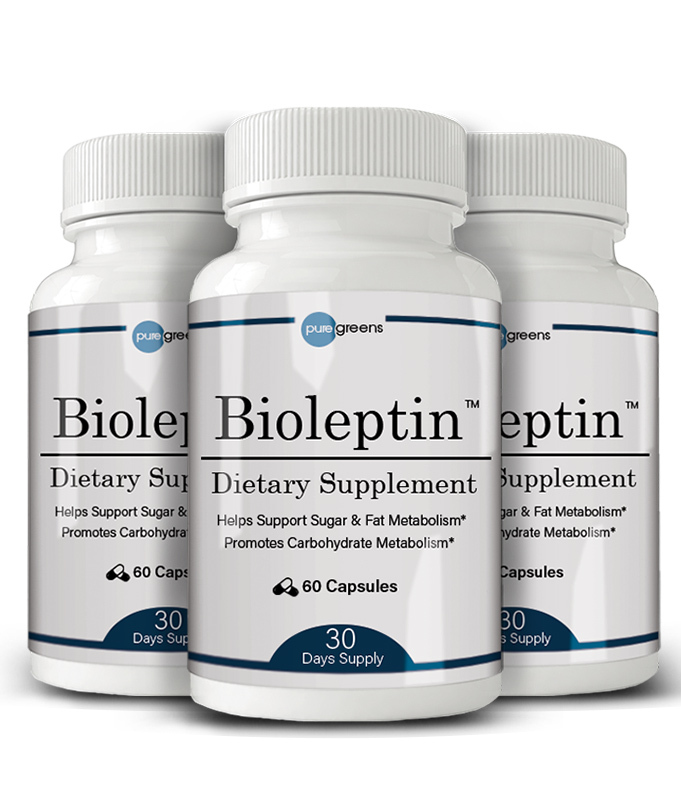 Give Bioleptin a try and see the difference it could bring to your life. 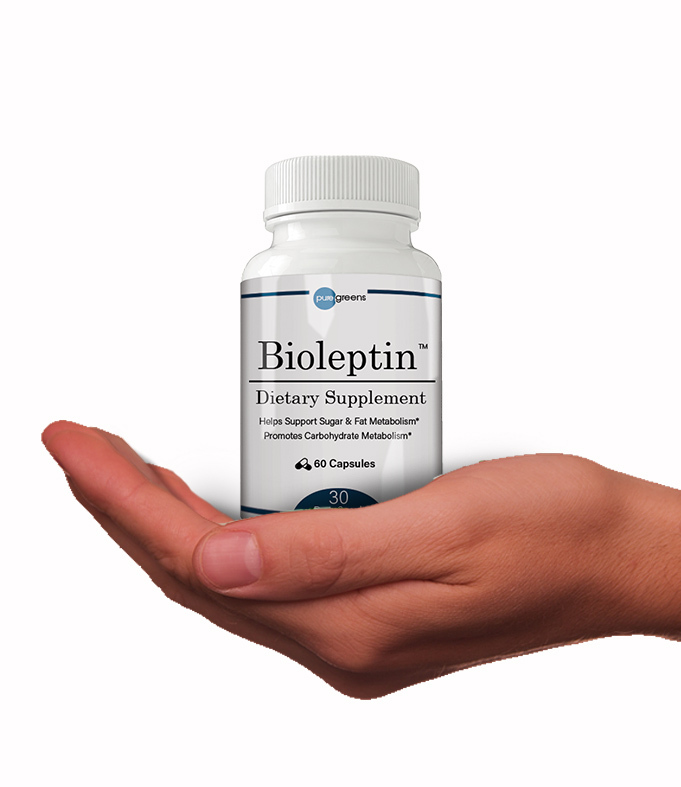 If at any time you are not happy with Bioleptin, just send back your empty bottles and we will refund you immediately. No questions asked. We pride ourselves in our product and service and want you to be absolutely satisfied. I noticed my pants were not as tight. I lost 20 pounds in 3 weeks and I feel great! I knew this was working for me when I noticed my pants were not as tight and lost all that weight without going to the gym. It suppressed my appetite. I have more energy and I sleep well. It really works! I have lost 22 pounds and I’m now very fit. I climb stairs and ramps with no problems. I walked 5 miles very easily and I feel healthier. Nothing else I tried has done this! I noticed my blood pressure is much better – 101/69. My stomach is shrinking and so is my belly. My stomach is shrinking and so is my belly. People at the gym are commenting about my weight loss. I am shocked! Even when I have managed to lose weight my belly never gets smaller. I am no longer a skeptic. It stopped my cravings for sugar and helped release stubborn fat around my stomach better than anything else. Within two weeks my weight decreased from 108 kgs to 102 kgs. After about a week I found that my hunger decreased—especially snacking at night. Within two weeks my weight decreased from 108 kgs to 102 kgs. This included some dietary changes as advised by a dietician. It suppressed my appetite. Other products did not give me noticeable effects. I have melted away extra weight and gained back the energy I had in younger days. I have tried to lose the 30 pounds I gained since moving in with my daughter. I tried other weight loss products. Nothing worked and I was about to just give up. Thanks to BioLeptin I have melted away extra weight and gained back the energy I had in younger days. I am going to continue to use it until I reach my goal weight. BioLeptin is helping me slowly taking pounds off. I have tried have failed. So far, BioLeptin is helping me slowly taking pounds off. I still have desires to eat snack foods but it’s not as bad as before. And I have fewer aches and pains in my joints, too. I weigh myself every morning and starting about the 8th day after taking Bioleptin I did start to drop about ¼ to ½ pounds a day. It has helped me get past the ‘stuck in the mud’ state that I’ve been in for almost 3 months. I have lost six pounds in a week and a half! My overall physical and mental health has increased dramatically! BioLeptin gave me the ability to WANT TO. I want to walk 3 miles. I want to take the stairs, to remember to bring my lunch to work, to have the energy to clean the bathroom. My overall physical and mental health has increased dramatically! I am losing 2 pounds per week. *Disclaimer: The Information And Recommendations Provided On This Website Have Not Been Evaluated By The Food And Drug Administration And Are For Educational Purposes Only. The Products Offered On This Site Are Not Intended To Diagnose, Treat, Cure Or Prevent Any Disease. You Should Always Ask Your Doctor Before Using Any Products.